We have already informed that Ukrainian politicians and agrarian tycoons announced their intentions to build «Е40» waterway from Gdansk (Poland) to Kherson. Waterway extending for more than 2000 kilometers that should go through the territory of Poland, Belarus and Ukraine is expected to connect the Black and Baltic Sea. It is for several years already that Belarus and Polish environmentalists have been trying to oppose implementation of such a large–scale project that will result in transformation of nature in the Polissia region. The Ukrainians know very little about this topic. In this report and subsequent ones we shall analyze environmental risks of Е40 waterway potential construction for Ukraine. 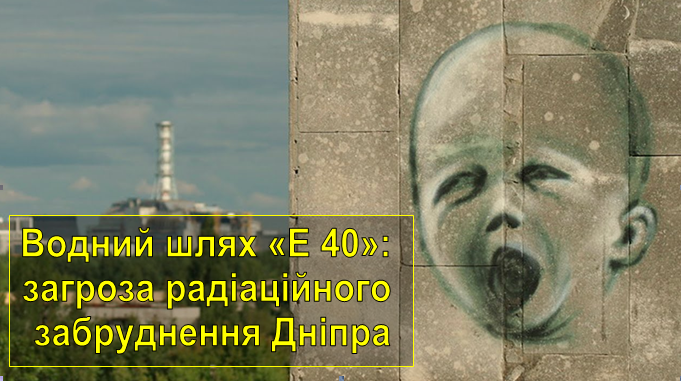 The first report will be about radiological threat, as Е40 will go through the whole exclusion zone of the Chornobyl NPP and Kyiv water-storage basin which still has radioactive silt at its bottom after the nuclear disaster at Chornobyl NPP in 1986. Disturbance of silt at the bottom of the water–storage basin, as well as in the Prypiat river bed will result in water exposure to radioactive particles that will be raised from the bottom together with silt. Dnieper water is a basic source of drinking water supply for Kyiv, Cherkasy, Kremenchuk, Dnipro, Zaporizhzhia, Kherson, Kakhovka, Kryvyi Rih and many other settlements. None water-treatment facility can treat the water from radiological particles while lack of actual flowage in the water-storage basin will make water contaminated for a long period of time. Under conditions of increasing deficit of drinking water it is doubtful whether the project will bring more profit rather than losses for the state. The National Target Water Economy Development Program and Environmental Recovery of the Dnieper Basin for the period till 20211 provides for the measures on reducing radiological contamination of water resources of Kyiv water-storage basin and not the increase in such contamination. One of the drastic environmental consequences of the Chornobyl disaster is contamination of water and water–areas of the rivers Prypiat and Dnieper with radioactive substances. Part of Kyiv water–storage basin is situated within Chornobyl exclusion zone. The water–storage area within the Zone is 2700 ha. However, radioactive silt is present not only within the Zone, but covers significantly larger areas due to its drifting along the navigation canal. Thus, the tendency is obvious. Currently silt sediments of Kyiv water–storage basin accumulate significant amount of the radioactive substances that came into the environment from the ruined reactor. Thus, according to the experts’ estimates, nowadays there are about 7200 Сuries of cesium-137 at the bottom of Kyiv water–storage basin. The average depth of Kyiv water–storage basin is 4,1 m, the maximum depth is 15 meters (just under the dam). Contamination of drinking water in water intake structures. The Dnieper also supplies water to water consumers beyond the boundaries of its basin. It is the main and sometimes the only source of water supply to large industrial centres in the south and south–east of Ukraine. The Dnieper–Donbas, Northern–Crimean and Kakhovka canals annually deliver 5-6 mln. km2 of water flow beyond the basin boundaries. In general, the Dnieper supplies water to 2/3 territory of Ukraine, including about 30 mln people, 50 cities and industrial centres, about 10 thousand enterprises, 2,2 thousand rural and more than 1 thousand utility enterprises, 50 large irrigation facilities and 4 nuclear power plants3. Fish contamination. The volume of annual commercial fishing in Kyiv water–storage basin constitutes from 500 to 900 tons4. At the same time it is difficult to estimate the scale of amateur fishing. After Chornobyl disaster the lion share of fish contamination fell on benthic fish that live at the bottom and feed on silt5. During the next years the situation was dynamically changing: accumulation of radioactive particles was mainly observed in predatory species of fish, as increase in the concentration of 137Cs, accumulated in water ecosystems, intensifies biotic migration and depositing of radionuclide in the endpoints of trophic chain6. Until 2000s the situation almost stabilized, that means that fish consumption was safe7. Disturbance of bottom silt will reverse the situation to its initial condition. Water contamination in fish farms of Kyiv Polissia that are filled with water from Kyiv water-storage basin. EPL addressed the State Fishery Agency, the State Water Agency and the State Emergency Service of Ukraine with a request to provide an official assessment of threats arising from potential construction of the Е40 waterway. 4 Курганський С. В. Стан запасів другорядних промислових видів риб Київського водосховища / С. В. Курганський, О. А. Бузевич, Н. Я. Рудик-Леуська. // Наукові доповіді Національного університету біоресурсів і природокористування України. – 2014. – № 7. – Режим доступу: http://nbuv.gov.ua/UJRN/Nd_2014_7_3. 5 Рябов И.Н., Белова Н.В., Полякова Н.И. Радиоэкологический мониторинг рыб – видов индикаторов радиоактивного загрязнения Киевского водохранилища в 1987 – 2000 гг. // Міжнар. конф. “П’ятнадцять років Чорнобильської катастрофи. Досвід подолання”. – К., 2001. – С. 2 – 34. 6 Волкова О.М., Беляєв В.В. Вплив гідрологічних факторів на формування радіонуклідного забруднення гідробіонтів // Ядерна фізика та енергетика. – 2009. – Т. 10, № 1. – С. 80–86.